Rent Alegre Farm-Rustic Banquet Room | Corporate Events | Wedding Locations, Event Spaces and Party Venues. Rancho Alegre Farm is the perfect setting for your upcoming event! Whether it’s a memory making birthday party, wedding, corporate, or family or event our picturesque farm provides an unforgettable experience. Upon entering Alegre Farm you’ll be greeted with the serenity of a real farm that provides a peaceful escape from the city. 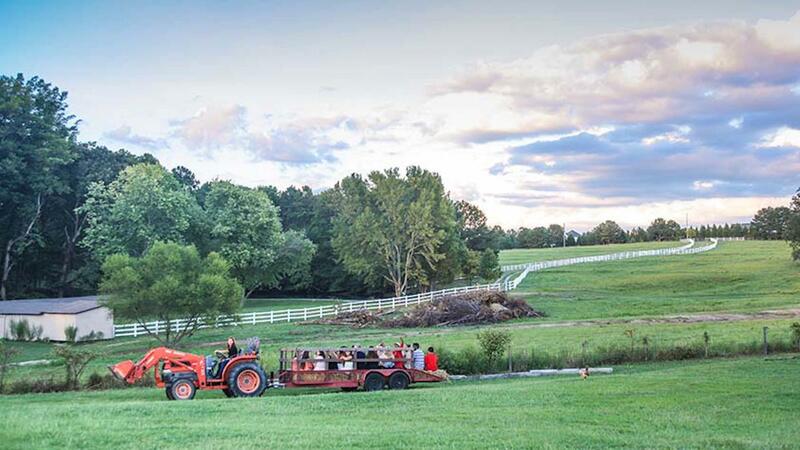 Our outdoor ceremony site provides a scenic view of the countryside that your guests will remember for years to come. Alegre Farm offers a variety of rustic, chic, and elegant decor choices for wedding ceremonies, including hay bale seating, rustic floral settings placed inside mason jars, white string lighting and much more. Rancho Alegre Farm offers a fun, rustic and relaxing atmosphere so you and your guests can enjoy your event with no worries. Our 15 Acre farm has a 3,500 square foot banquet hall with an open air and a covered patio on each side. Perfect for weddings, corporate events, team banquets and more. Our two large covered pavilions complete with picnic tables and grills are a perfect place to meet and relax outdoors for a meeting, family reunion, birthday party, or team celebration. Each Pavillion has its own playground for kids to enjoy.